The New Jersey Department of Environmental Protection (DEP), Historic Preservation Office and NJ Historic Sites Council are pleased to announce the 15th Annual Historic Preservation Awards recognizing the efforts of individuals, organizations and government agencies to preserve the State's valuable resources. 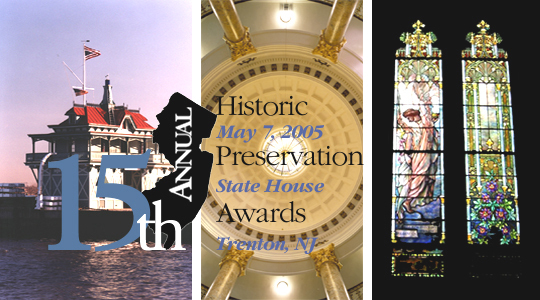 The annual New Jersey Historic Preservation Awards Ceremony will be held at the New Jersey State House Assembly Chambers, on May 7, 2005. 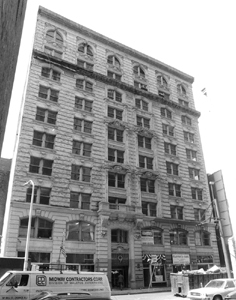 This ten story office building stood neglected and abandoned in the heart of Newark's downtown. The building was suffering from extensive water damage on the interior, causing a freeze thaw situation, buckling wood floors and cracking tile, marble and mosaics. While the façade was in relatively fair condition, limestone elements were weathered, there were cracked joints, need for stone and lintel patching and for replacement of missing cornice elements. Overall, the building facade required extensive cleaning. Regan Development Corporation recognized that despite its present condition, the building had "good bones" and set out to transform this wonderful structure into 63 luxury apartment units, re-introducing rentable retail storefronts and office space at the street level. The openness of the 7,500 square-foot floor plan at each floor was very adaptable to a creative apartment configuration allowing for natural light. Skylights, cast bronze and interior marble wainscoting and mosaic floors were retained and restored where they survived. The 274 windows were painstakingly removed and rehabilitated in an on-site workshop. Local unskilled labororers were hired and trained to perform the carpentry repairs, and windows were then reinstalled in their original openings. In addition, a new secondary egress stair tower was constructed in the existing court area. The work was so meticulously executed that it easily qualified for federal investment tax credits. The total cost for this transformation was $6.5 Million. In the end, 30 years of deterioration, weather damage and structural faults of this barren skeleton of a building were transformed. It is now restored to much of its original brilliance bringing new life to revitalization efforts in downtown Newark. Recognition goes to: Regan Development Corporation; Mikesell & Associates, Architects; Del-Sano Contracting Corp.; David A. Sobine, Inc., Construction Management; FPS Design, Project Engineers; KLG-Yoon Inc., Mechanical Engineers; Zakalak Associates, Preservation Consultants; Guerreiro Construction; South Jersey Gypsum Floors; Nova Development Group, Inc.; Union Stone; A&B, LLC; Paint & Roller; American Cabinetry, Inc.; William Rauh Roofing; Tru-Fit; HASCO Industries; Lance Studios; Rotavele Elevator; Ponzo Mechanical; AGS Plumbing & Heating; Supreme Heating & Air; Power Electric. This 1874 lighthouse was declared surplus property and decommissioned by the U S Coast Guard in the 1970's. A small group of local citizens banded together to save this gem from demolition and since then, has worked tirelessly to not only see it saved and preserved, but functioning as an important maritime interpreter to thousands of visitors each year. It is owned by the state and leased to the North Wildwood Lighthouse Commission. Unlike most tall conical shaped masonry towers, this 4th order tower & lantern is residential in scale, a wood frame building that was meant to house a family and keep the light burning at the same time. Taking 7 years, the project cobbled together funding from a variety of sources including the NJ Historic Trust and federal transportation enhancement funds matched by visitor donations. The project included a new roof, overall exterior repair or reproduction of missing architectural details, restoration of windows, doors, siding, porch structures, and exterior painting to match the historic period paint analysis. The final phase of work consisted of interior rehabilitation, asbestos abatement, fire suppression, and a new HVAC system. The cost for all phases is estimated at $1.1 Million dollars. This award truly exemplifies the importance of volunteers. The community support for this project was reflected in the numerous letters of recommendation that were received in support of the nomination, from both federal and state legislators as well as from directors of area organizations and chambers of commerce. "The Hereford Inlet Lighthouse and its "keepers" are inseparable - one being a timeless historic site for the State of New Jersey and the other the very heart & soul that drives its preservation and utilization for present and future generations." -Bob Trapani, President of the Delaware River and Bay Lighthouse Foundation, Inc. Recognition goes to: The Friends of Hereford Lighthouse and Mrs. Phyllis Catanoso, Founder and First Chair; Aldo A. Palumbo, Mayor, City of North Wildwood; Ralph Patrella, Chair, North Wildwood Lighthouse Commission; Paul DiFilippo, Past Chair, North Wildwood Lighthouse Commission; Steve Murray, Past Chair, Prinicpal Curator, and Interpreter of Colllections; Peter Harp, Acting Keeper; Betty Mugnier, Historic Site Manager and Chief Tour Guide; Hugh J. McCauley and United Architects, Project Architect; Haverstick Borthwick, General Contractor. Adaptive Reuse is an important aspect to preserving the built environment, but religious buildings are one of the most difficult building types to re-use while maintaining architectural character and quality. Currently this building houses the Allentown Public Library, but it was originally built in 1879 as the First Baptist Church. 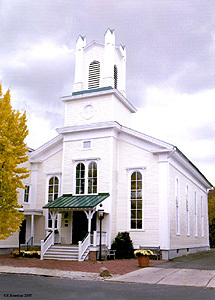 The building suffered a fire in 1972 and the congregation rebuilt at a new location. The windowless, burned out building was purchased by the Library Board, cleaned up and became a new home to their collection of books. Once all mortgages were paid in full in the early 1980's, a decision had to be made about the building's future. Should it stay a library or become something new? The final determination was that the building was well suited to become the local library. Beginning with an emergency stabilization grant in the mid-80's, the Library Board has been fund raising for the last three decades, completing the transformation in 2004 with the building's exterior facade restored to its former 19th century elegance. The entire project totaled more than $1 million in rehabilitation costs. Anonymous donors and community donations provided the match for grants from the State Library Title II grant program, the Monmouth County Historical Commission and from the NJ Historic Trust. One of the most impressive accomplishments of this project is the sensitive insertion of the new use; books, study carrels and circulation desk, barely detract from the interior that once housed religious ceremony. The balcony has been retained, restored in place and now appropriately hosts musical recitals. The spirit of the community has been captured in this community effort. Nominated by the chair of the local historic preservation commission, this project is a wonderful example of sensitive re-use, respecting the architectural qualities that reflect the building's significance while effectively housing a new community use. "The residents of Upper Freehold pride themselves on a small rural community deep with history and the Allentown Public Library has been a part of that. The great Italian philosopher, Cierco, once said, 'To add a library to a house is to give that house a soul'. The Allentown Public Library in many respects is the soul of Upper Freehold Township." Recognition goes to: The Allentown Public Library Board, Judy Reynolds, President and Nancy Stein, Head Librarian; Cyndee Jonas and Dan Zorovich, Municpal Liasons; Thomas Kocubinski, Project Architect (Emergency Stabilization); Ricardo Perez, Design Link Construction Management; Michael Calafati, Historic Building Architects; Robert Frizell, Inc., Structural Contractor; Mario Di Maria, Porch Contractor; Joe Shaffer, Painter; Chuck Goss, Roofer; and John A. Ruddiman, CPA. This award represents a project of heroic effort. The original administration building at Newark Airport was constructed in 1935 as the centerpiece of the most significant airport in the world at that time. This building was witness to many important firsts in aviation history, and included an air traffic control center, weather bureau, post office, and night and instrument landing capability. The building design of swept back wings allowed planes to approach the building and the waiting passengers. Previously, passengers would walk across the tarmac to board planes on the taxiways. 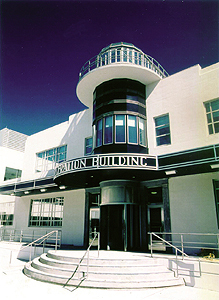 The building also housed a restaurant, offices and hotel rooms to serve the public and airport staff. Aviation pioneers such as Charles Lindbergh, Amelia Earhart, Richard Byrd, and Howard Hughes all spent considerable amounts of time at the airport during this period. With the extension of Runway 22R, the building could no longer be utilized in its original location. The airport's need to relocate fire fighting operation and administrative function became the impetus for the project. The building was lifted and separated into three parts and moved on hydraulic-controlled, soft-wheeled dollies one half mile along taxiway Zulu to a prepared foundation. Lowered into position, the building was knit back together and prepared for a new addition. The sensitively designed addition was sited on the 'air side' of the historic building, with a low profile so as not to be visible form the main public 'landside' entry approach. Creating an internal courtyard, provided not only open space for employees but public accessibility to the historic control tower. Interior spaces were categorized by their significance and the main lobby area, rooftop control tower and principal airside and landside entrances were restored. An interpretive exhibit describing the airport's development is now located in the main lobby. While the ten controversial murals painted by modern expressionist artist Ashille Gorky were either lost or relocated to the Newark Museum, one of the murals, Aviation in America, has been reproduced with accompanying text and placed near its original location in the second floor lobby. This project cost $55M, and took 2 ½ years to complete. At a time when transportation authorities and public agencies have been severely stretched, by implementing broad sweeping security measures, while maintaining basic operations and services, the Port Authority, a bi-state transportation authority, stands out for their continuing commitment to preserving an important slice of the nation's aviation history. Recognition goes to: The Port Authority of New York and New Jersey; Beyer Blinder Belle, Project Architects; Prismatic Development Corporation, General Contractor; Parson Brinckerhoff Quade & Douglas, Inc, Structural and Electrical Engineers; Maitra Associates, Mechanical & Plumbing Engineers; Susan Brady Lighting; Accu-Cost Construction Consultants, Inc., Vertical Transportation; Lerch Bates; James R. Gainfort, Architect (Envelope Consultant); HNTB Architects Engineers Planners, Civil Engineer; Rudi J. Van Leeuwen, PE, Relocation Consultant; Jablonski Berkowtiz Conservation, Inc., Architectural Conservator; Wells Appel, Landscape Architect. Good stewardship is perhaps the most critical aspect of ensuring that historic buildings do not vanish from the landscape. Our next recipient embodies good stewardship, vision, advocacy and leadership all rolled into one person. Since her retirement from her "real career" Patricia Anne Salvatore has dedicated her life to the preservation of Cape May County's historic past. Because of her vision, Historic Cold Spring Village, a collection of late 18th and 19th century buildings saved from demolition by their relocation, has become a regional tourist destination for thousands of visitors each year. As the Village's non-salaried executive director, she has established an education program that offers a variety of year-round programming to schools. The Village's award winning 'distance learning' program has enabled these programs to reach audiences well beyond New Jersey school children. But Ms. Salvatore's contributions go further than Cold Spring. Together with her husband Joseph, Hangar #1 at the Cape May County Airport has been rescued, the Naval Air Station Wildwood Foundation formed and the hangar now stands as a wonderful tribute to WWII Navy fighter and dive-bomber pilots, a testament to their role in military history. Never retreating from a challenge, the Salvatore's have often contributed their own financial resources to protect historic buildings from the elements. To date, they have contributed over $1 million in personal funds to preserving the unique historic architectural heritage of this state. Mrs. Salvatore advocated the idea of heritage tourism before the phrase became a household word. She has committed herself to promoting history like no other individual and has been fostering the linkages and partnerships that are so key to enhancing the image of New Jersey for residents and tourists alike. Mrs. Salvatore serves on numerous boards, commissions, and advisory panels and has been recognized by numerous organizations, including the Smithsonian Magazine/Traveler's Conservation Foundation International Award for Outstanding Achievement in Preservation and Tourism, for her lifetime dedication to the history and preservation cause. 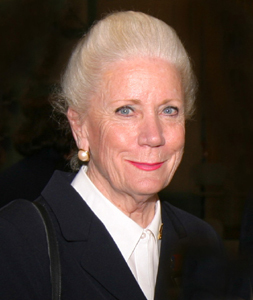 Patricia Anne Salvatore is a generous volunteer, an engaged civic leader, and an inspiration for every historic site. She is deservedly recognized for everything that she has contributed to the historic preservation community in New Jersey. "I am continually in awe of this dynamo with her "can-do" attitude, and I firmly believe that if every historic building in this state had Annie Salvatore as its advocate, then the words "demolition by neglect" and "tear down" would no longer be in the preservation community's vocabulary." This award recognizes a history-laden community, a governing body with vision, and a developer with experience in creating homes out of abandoned buildings, resulting in a blighted neighborhood transformed into a catalyst for community revitalization. The Hedge Carpenter Thompson neighborhood was listed in the New Jersey and National Registers of Historic Places as the first step in pursuing federal investment tax credits. But, in order to make this project work, the city had to resolve issues such as absentee landlords, excessive vacancy, the stigma associated with neglect, and the process of declaring this neighborhood an area in need of redevelopment. Seventy-six (76) historic units over a six-block area were rehabhilitated, creating a total of 104 rental apartments. New, sensitively designed infill construction created an additional 28 ADA accessible residential units on vacant lots. Aside from the usual worklist associated with the reuse of historic buildings, this project stands apart, having integrated PSE&G's Energy Efficient, 5-Star Program, ensuring energy efficiency was one of the project goals. Balancing the need to retain historic fabric while achieving the Energy Star ratings required unique solutions. For instance, the original wood clapboard siding, installed directly onto the balloon framed wood studs, had to be retained in place. This meant that the introduction of wall insulation had to allow for proper airflow to the interior face of the siding while achieving acceptable insulation values. The solution: a one-inch air space directly behind the existing siding was created by installing rigid foam panels sealed with foam caulking in each wall cavity, over which fiberglass batt insulation was installed. The total cost of this project was $11.58 million. The nomination was made by the Salem Main Street program, and supported by Preservation Salem, and the Salem County Historical Society. "The changes have encouraged a new vigor in the city, attracting people and investment. There is a renaissance going on; it may take time, but I think we can make it happen." Recognition goes to: The City of Salem, Mayor Earl R. Gage; Charles Lewis, Esq., Pennrose Properties, Developer; Beth Kitchen, PP AICP, Project Architect; Robert Danton, Builder;Tim Noble and Shelby Weaver Splain, Noble Preservation Services, Preservation Consultants. Sometimes the remnants of our industrial heritage are overlooked when an urban area sets about to remake itself. This was not true in Paterson. 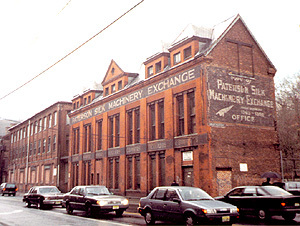 The former Rogers Locomotive Works, which later became the Paterson Silk Mill, is a contributing property in the Great Falls Historic District, and has been recycled yet again. Today this resource serves the community as a place of employment and opportunity for low income individuals to find economic independence. The two buildings combined represent more than 42,500 square feet of adaptable space. After years of abandonment, neglect and water infiltration, both from above and from the raceway canal below, these rehabilitated structures now house a variety of community services including offices, transportation industry related user groups, job shuttle service, job training, a charter high school, and the Paterson Family Center preschool. The second building also provides residential facilities and support spaces for troubled youth. Preservation guidelines were closely adhered to in ensuring that the character of these industrial icons would be preserved while incorporating their new uses. The large central skylight, once filled in, was restored in its original location; ductwork, sprinklers, electrial conduit and the original structural framing were left exposed, both for ease of maintenance and to preserve the original industrial look of the building. Secondary egress was achieved by upgrading the fire rating of the two-story bridge that links the buildings. This project is an outstanding example of how private development, social needs and city and state authorities can come together to create an economically viable and socially progressive project. The project cost of $6.5 million was funded through the NJ Historic Trust, a Transportation Enhancement grant from NJDOT, and a congressional appropriation from the United States Congress. Recognition goes to: NJ Community Development Corporation, Owner; A & A, Construction and Management Consultants; Human Services and Community Development, Owner Representatives; Atkin Olshin Lawson-Bell, Architects; Urbitran Associates, Inc., Landscape Design; E & M Engineering, Mechanicals; Ortega Consulting, Structural Engineering; Maribel Beas, Preservation Consultant; Mellick-Tully & Associates, Inc., Environmental Consulting; A & J Consulting Engineering Services, Communications; International Consultants, Inc., Cost Estimating; Integrated Construction Enterprises, Inc,. 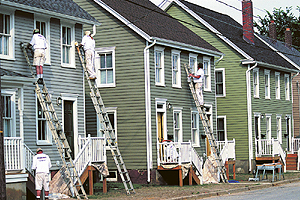 Exterior Restoration; APS Contractors, Inc., Interior Restoration. Paulsdale, a National Historic Landmark and birthplace of women's suffragist Alice Paul, has been rehabilitated. The house, now serving as the headquarters for the Alice Paul Institute, was made ADA accessible, and adapted to accommodate meeting and workshop rooms on the first floor with shared office space on the second. 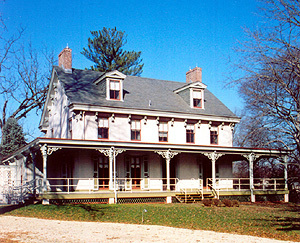 The exterior was restored to the period when Paulsdale was occupied by Alice Paul and her family and operated as a 177-acre farm. A new kitchen and public restrooms were incorporated; new HVAC , lighting and electrical systems were integrated; an accessibility ramp was designed; and new plumbing and fire detection/security systems were added. Interior wall and ceiling finishes were repaired and refinished as needed. Aside from the fabulous execution of this project, the Institute works tirelessly to educate the public on the life and work of Alice Stokes Paul, author of the Equal Rights Amendment, founder of the National Woman's Party and life long activist for human equality. The Institute has developed a leadership program using the history of accomplished women to help today's young women develop their own potential. The Institute was the impetus behind the Women's Heritage Trail and continues to promote the preservation of sites associated with women's history. The grand total for this transformation was $1.4 million. Funding was made possible from a variety of sources including the NJ Historic Trust, the Andy Warhol Foundation, the Casino Reinvestment Development Authority, the Heritage Investment Program (division of Pew Charitable Trusts), the Burlington County Freeholders, US Dept. of Housing and Urban Development, special legislative appropriations and many, many individual donations. This carefully preserved and restored historic landmark will withstand the test of time and continue to inspire and touch those who visit here. It reflects the strength and determination of its namesake, Alice Paul, and, thanks to the Alice Paul Institute, will remain a symbol of excellence into the future. Recognition goes to: The Alice Paul Institute, and Rhonda Carboni, Executive Director; Lou A. McCrory, John Bowie Associates, Project Architect; Bob Frizell, Robert Frizell Inc., Contractor; Ford & Associates, Land Surveyor; Frank McKelvey, Interpretive Planner; Heritage Investment Program; Keystone Engineering Group, Electrical; Kittatinny Archaeological Research; Matt Mosca, Paint Analysis; Nova Consultants, Wetlands Specialists; R.E. Coleman Associates, Engineers; Sandy Lloyd, Architectural Historian; Susan Mattison, Landscape Architect. 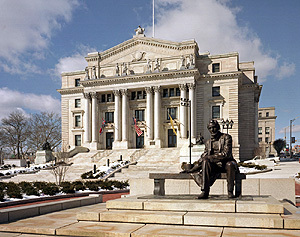 Designed by nationally know architect Cass Gilbert, the Essex County Courthouse was dedicated in 1907, and is an important landmark in downtown Newark's historic landscape. Deferred maintenance over the years led to chronic roof leaks, and the beautiful Tiffany glass skylights, sculptures, and extensive murals were at risk of being lost forever. The restoration was undertaken in three sequential phases. The first phase of work included developing a space allocation program for the Civil Division of the Superior Court, and undertaking a careful architectural and historical analysis of the existing building. The second addressed the exterior of the courthouse. The marble façade was cleaned and restored. Missing and deteriorated decorative elements were replicated and the monumental wood windows were restored. Nine marble statues on the entablature, representing ideological concepts of the justice system in America, were also restored and were retrofitted with seismic restraints. The third and final phase focused on the interior spaces, incorporating modern amenities and fully restoring interior while adding new courtroom space. One of the most interesting aspects of the project was the restoration of the building's historic furniture, including original pieces designed by Cass Gilbert specifically for the Courthouse. The Rotunda, one of the most spectacular spaces in the courthouse, is capped by a central, Tiffany stained glass skylight flanked by two smaller side domes. The curved walls of the dome, the pendentives, are graced with murals by artist Edwin H. Blashfield representing the female allegorical figures of "Wisdom", "Knowledge", "Power", and "Mercy." The total cost for this magnificent undertaking was $40 million. The commitment on the part of the Essex County Government is unparalleled. Thanks to their vision and understanding of stewardship, this symbol of democracy and justice will once again shine with its historic period grandeur. Recognition goes to: Essex County and Joseph N. DiVincenzo, Jr., County Executive; Melinda Cortex, Essex County Dept of Public Works; Farwell Mills Gatsch, Historic Architects; J.R. Loring and Associates, Mechanical and Electrical Engineers; Schoor DePalma, Structural Engineers; Bareto/Dowd, Landscape Architect; Switzer Group, Interior Architect and Furniture; Ann Kale Lighting; Building Conservation Associates, Materials Conservation; Acentech, Inc., Acoustics and Audio-Visual Systems; Julie Sloan, Stained Glass Conservation; Welsh Color and Conservation; Paint Analysis; Triestman and Sons Inc.; Furniture Restoration; Cobra Construction Company, General Contractor; Hall Construction Company; Finish and Restoration Contractor; Evergreene, Mural Restoration; Tishman/Century 21; Construction Management.